Before the third and final beep sounds – which is in theatrical and operistic traditions the last notice for the foyer to be vacated and for seats to be taken – I must briefly point out that my goals with these contributions and this category are not properly rigorous from a scholar vantage point. Academically strict writings are to be found on Reviews and Essays. What we are looking for here on News and Comments is inter alias to encourage free and open debate, a reflection start-up so to speak. So… take your seats and take part! i) As in every premiere, it seems only suitable to meta-analyse what lies before us. UNIO Blog comes to stage at just the right time to promote academic discussions involving the European Union and its legal/political system throughout society. In the path of the finest European tradition, the Centre of Studies in European Law of University of Minho (CEDU) deserves a project of this kind due to its acclaimed reputation. Research centres of European DNA are known for their critical autonomy and for spreading ideas, for scientific freedom and for intercultural pluralism. Concerning both their agents and their contents. Know this, all readers, authors, partners and critics, such values are in the core of this blog. They move it. Some of the greatest journals and reviews of the world keep a platform like this one in order to enhance more informal, open and free considerations amongst their collaborators. Unlike the American experience in which it is absolutely and placidly accepted the express and public defence of a certain line, stream or current of thought as well as its interests´ protection to which the think tank adheres, this space is the respectful democratic house of the most diverse scientific-academic theoretical orientations. ii) Let´s move to the substantial matter of this comment. The subject has been on the news. Portugal has been seeing a complex election afterwards situation. Not only politically, but also historically and legally/constitutionally. For the first time in 40 years, – that is since democracy was re-established with the dissolution of the Salazarista regime – the winning party is not able to present a stable government proposal. 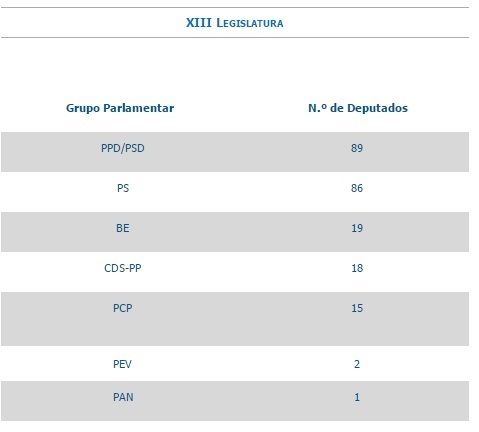 The coalition between right-wing PSD (89 elected members) and CDS (18) does not hold majority in the Parliament and it has failed to accomplish some sort of agreement (by abstention, for instance) with the Socialists (86) and Leftists (19 + 15 + 2). Altogether the latter group can compound an absolute majority to form the government. Apart from questions concerning the legitimacy of an alliance shaped only after the elections and the anti-EU agenda of leftist parties, the issue that interests us here is the formation of a new government. The Portuguese constitution imposes the results to be considered when a new administration comes to office. Based on that, the President decided to (re)appoint Mr. Pedro Passos Coelho as PM – what must yet be approved by the Parliament. Opposition parties have already announced that they will reject this proposal in favour of another one, now led by the Socialists. Up to now, this is the situation for the time being. All those events took place from October, 4th (election day) and October, 27th (the day when the names of officials and ministers were brought to light for the new, fragile – and probably short lived – government). The problem is this. According to the Treaty on Stability, Coordination and Governance in the Economic and Monetary Union – TSCG, created amidst the financial and economic crisis and away from the “community/Union method”, all Member States of the EU that are part of the Euro Zone must present a draft for the annual budget. The deadline for 2016 was October, 15th 2015 when Portugal´s institutions were still negotiating and figuring out what to do. As they still are. It seems rather obvious that it was not possible, nor advised to send a draft and compromise the country to a Budget that does not reflect the political views of the upcoming administration. It would only mean to send a false proposition with false numbers and false priorities – even if TSCG somehow restrains public spending. It would lack mutual confidence. Naturally, the European Commission was alert. That comes with no surprise as the EC is in charge of protecting the Treaties, law enforcing and defending the Union. In that sense, Portugal would be infringing EU legal system because it has failed to fulfil its obligation to prepare and send the draft. Valdis Dombrovskis, vice-President of the EC and responsible for the Euro and Social Dialogue, was fast enough to come to public and in a press conference let the entire Union know that the EC might act against Portugal. Quoting his words: “it´s not excluded in any case that we could take some action”, also referring that there´s close contact kept with the Portuguese authorities. Although arguably desirable, the warning has indeed juridical basis. Apparently there has been a failure by a Member State and the EC holds the judicial legitimacy to ignite the process, first pre-Court and then in the CJEU, according to the procedures given in articles 258 to 260 of the TFEU. Nonetheless, we must also read article 4, N. 2 of the TEU. It reads “The Union shall respect the equality of Member States before the Treaties as well as their national identities, inherent in their fundamental structures, political and constitutional, inclusive of regional and local self-government…” (highlighted). Well, is the appointment of a new government part of a national identity or is it not? Considering that the government is the direct result of the expressed will of the People, the answer can only be positive. It seems clear that the constitutional identity is part of that and it´s also part of the constitutional pluralism that shapes the EU and the EU legal system. The Portuguese “failure” can hardly be called a failure. The CJEU has never been asked to rule on that matter. Yet at least. If it comes down to that, does it make sense to support and reiterate the case law/jurisprudence of the Court casted in similar-not-equal occasions and reject the argument of “constituting a government” because an internal circumstance is not excuse to prevent the application of EU law? Particularly, a more interesting alternative – from all stand points – would be the EC release its reasoned opinion and wait for the Member State´s observations. Acknowledged those observations, the EC making use of its discretion (opportunity and convenience) decision would end the infringement procedure right at this point. The European demos is, well, democratically and legitimately respected. The Rechtsstaat remains preserved and so does the constitutional pluralism. A juridical-political solution for a juridical-political cul-de-sac. (1) The table credits can be found here. Paris attacks – test on EU values or the chance to rebuild a more united and welcoming Union? Passing-on of Overcharges: Will the National Courts Lead the Way Forward?